One of the top concerns in public health today is exposure to the metallic element mercury within the environment. At abnormal levels, mercury can have a toxic effect on our nervous systems and cause other health problems. These concerns over mercury have also increased attention on one material in dentistry that has included the metal in its makeup for over a century — dental amalgam for filling teeth. Amalgam is a metal alloy that can include, in addition to mercury, silver, tin, and copper. When first mixed dental amalgam is a moldable material used for fillings in prepared teeth. It then hardens into a durable restoration that can withstand biting forces. While the use of amalgam has declined with the introduction of life-like colored fillings, it's still used for teeth like molars subject to high biting forces. With what we now know about the ill effects of mercury (which can make up to half of an amalgam mixture) is it safe to continue its use? 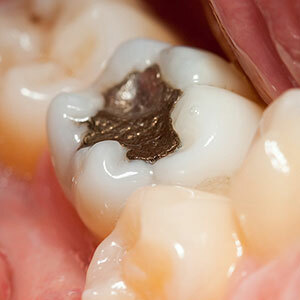 The American Dental Association has performed extensive research into amalgam safety. They've found that mercury is stabilized by the other metals in the amalgam. This prevents "free" molecules of mercury, the real source of harm to health, from escaping into the blood stream in the form of vapor. Although trace amounts of mercury vapor from the amalgam are released as a person chews, those levels are well below the threshold that could cause harm. From a patient standpoint, the biggest drawback to dental amalgam isn't safety — it's the appearance of teeth it's used on. Silver fillings aren't considered attractive. And now there are viable filling alternatives that not only look like natural teeth but can withstand biting forces almost as well as amalgam. These materials include composite resins, mixtures of glass or quartz within resin, or glass and resin ionomers. Each of these has advantages and disadvantages depending on how and where they're applied. After a thorough dental examination, we'll be able to advise you on what filling material will work best to produce the best result. And if we do suggest dental amalgam you can rest assured it will be a safe choice.